Multifunctional materials with different functions can be performed simultaneously or sequentially and developed so as to improve system performance. The best means of producing multifunctional materials are composite materials with the desired properties. Composite materials can be obtained with a combination of multi-phase materials with different characteristics. Each of these phases has the ability to demonstrate a significant portion of the unique features and does not preclude other of a phase function. 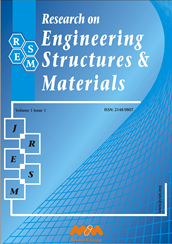 In this study, an epoxy resin was converted into a multi-functional material as a coating material in military aircrafts. It has the ability to perform multiple functions intended to have radar absorbing and flame retardant properties. Epoxy resin was the matrix of the composite, and huntite/hydromagnesite mineral is added to the composite matrix to achieve flame retardancy. Barium hexaferrite particles were used for radar absorbing property. The powders were produced by sol-gel method. The additive material is determined whether amount-dependent properties of varying the amount. The resulting samples were characterized by scanning electron microscopy (SEM) and X-ray diffraction (XRD). Also the flame retardant and radar absorbing properties were investigated. As a result, both materials contribute to fulfill their primary function. Besides, it was concluded that the materials generate beneficial effects together as synergistically.